To profoundly understand biology and harness its intricacies for human benefit and the mitigation of human harm requires cross-disciplinary approaches that incorporate sophisticated computational and mathematical modeling techniques. These integrative strategies are essential to achieve rapid and significant progress in issues, in health and disease, which span molecular, cellular and tissue levels. The use of mathematical models to describe various aspects of tumor growth has a very long history, dating back over six decades. Recently, however, experimental and computational advances have improved our in the understanding of how processes act at multiple scales to mediate the development of tumor vasculature and drive the advancement of cancer. This book will showcase the development and utilization of new computational and mathematical approaches to address multiscale challenges associated with tumor vascular development. In Part I: Cell Signaling and Molecular Aspects of Tumor Blood Vessel Formation, it will be come clear that mathematical modeling can help to biochemically and biomechanically phenotype one of the most important cell types involved in cancer progression: vascular endothelial cells. When subverted by the tumor modulated environment, vascular endothelial cells form a new vascular supply capable of nourishing and translocating cancer cells to other tissues. The models in Part I illustrate the importance of quantitative approaches for gaining a deeper understanding of how normal and abnormal aspects of signal integration culminate in the cell proliferation, migration, and survival decisions that result in pathological tumor angiogenesis. The focus of Part II is the angiogenesis cascade and all of its complexities. Successful angiogenesis is mediated by the intricate interplay between biochemical and biomechanical mechanisms, including cell-cell and cell-matrix interactions, cell surface receptor binding, and intracellular signal transduction. A major challenge facing the cancer research community is to integrate known information in a way that improves our understanding of the principal underpinnings driving tumor angiogenesis and that will advance efforts aimed at the development of new therapies for treating cancer. The chapters in Part II will highlight several mathematical and computational approaches for that can potentially address this challenge. While the first two thirds of the book's chapters demonstrate how important insights can be gained by studying cell signaling and vascular morphology and function, the series of chapters in Part III: Whole Organ Modeling of Tumor Growth and Vasculature, will integrate vasculature development with tumor growth dynamics. These two processes strongly depend on one another in ways that can only be theoretically investigated by biophysical approaches that cut across several levels of biological organization and describe both the tumor and the developing vasculature as they co-evolve. 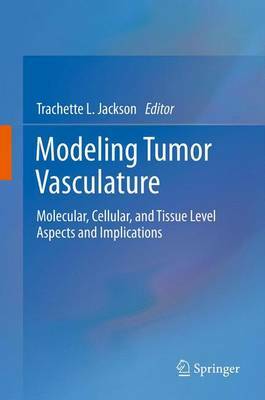 The purpose of this edited volume is not to provide a comprehensive review of all modeling efforts that address tumor vascular modeling; instead, a variety of interesting and innovative mathematical modeling approaches for understanding the development and effects of tumor vasculature are highlighted in order to illustrate some of the emerging trends in the field.